In 'piecing' or 'patchwork', small pieces of fabric are sewn together to produce a decorative design. The most enduring method in Britain is done by hand, and is known as 'piecing over paper'. The pattern is first drawn onto paper and then accurately cut. Small pieces of fabric are tacked round each of the shapes, and then joined together from the back using overstitch. Geometric shapes produce some of the most striking examples. 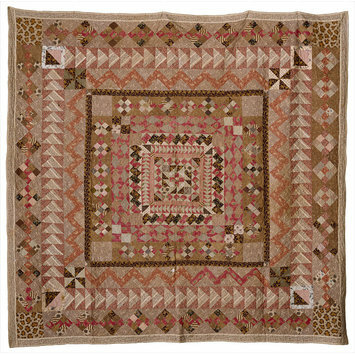 Hand-quilting is done on a frame using needles called 'betweens'. The stitches are executed with one hand; the other hand is kept underneath the quilt to feel for the needle. Small, uniform stitches (usually a 'running stitch') are taken through the three layers to form a decorative design. 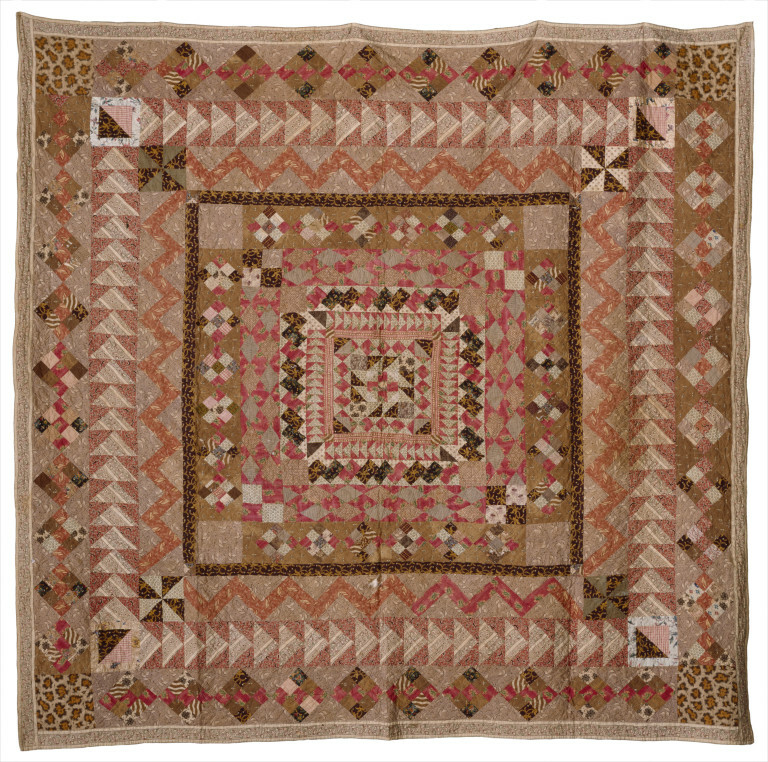 At the time this quilted bedcover was created, the British textile industry was producing a great variety of printed cottons in different qualities, available at different prices. Textile designs were developed with an emphasis on novelty, such as the four large leopard skin squares in the corners. Quilted patchwork bed cover of printed cottons in a number of small-scale designs. Some are dress fabrics that date from the 1820s to 1840s, including a cotton in an animal print design in the four corners. There are 1,690 patches in total. It is quilted in running stitch in cotton thread in what is now known as the 'wine-glass' pattern (overlapping circles). There reverse has been constructed from eight separate pieces of cotton and linen. Wadded with cotton. 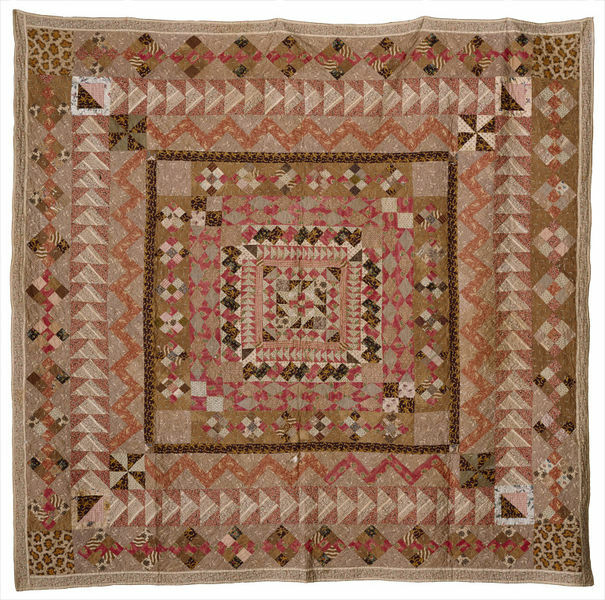 Quilted patchwork bed cover of printed cotton and linen, possibly made in Wales, 1830-1840. This bedcover contains 1,690 patches. When it was created, the British textile industry was producing a great variety of printed cottons in different qualities, available at different prices. Textile designs were developed with an emphasis on novelty, such as the four large leopard-skin squares in the corners. The repeal of the Excise Duty in 1831 reduced the cost of most domestically produced goods for home consumption by 30-40%.